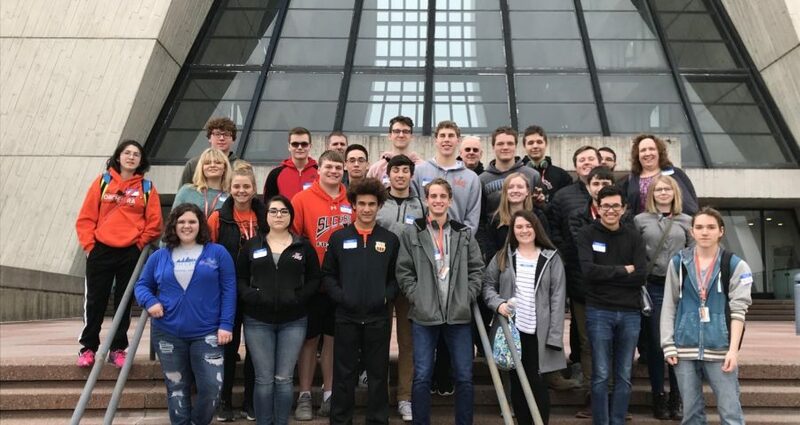 AP Physics students were given the opportunity to attend a trip to Batavia, Illinois, to visit the Fermi National Accelerator Laboratory on Thursday, March 21st. Students were given the chance to observe many different aspects of the accelerator laboratory, observe a presentation by a scientist from Italy, visit a bison farm, and view the four mile radius from the 15th floor of Fermilab. “Getting to actually see different things we have talked about in class was a really cool experience for all of us,” Matthew Frecke, senior, said. Each student had a favorite part of the tour, many leaning towards visiting the bison at the end of the trip. Some, though, found other aspects of more interest to them. Jill Ross, senior AP student, plans to study bimolecular or aerospace engineering after graduation, and learning about the projects done at Fermilab was right up her alley. “Visiting Fermilab was like visiting a portal to the universe. Particle physics often seems like a small, distant idea to people, but the mechanics behind it encompasses the way our world works-and to have seen that in action at Fermilab was a thrilling experience,” Ross said. Though AP Physics is one of the most difficult AP classes available for students to take, Mrs. Owens, Physics and AP Physics teacher, enjoys providing unique and engaging ways for students to learn and prepare for the test. “Visiting Fermilab is a great way to show students how the material they are learning in class can apply to current research. Students can see scientists at work and see their day to day work life. Being so close to such a large research facility is exciting, and I am grateful to be able to share that with my students,” Owens said. Having the opportunity to extend knowledge outside of a classroom is important for all students and is especially vital for AP students looking to earn college credits through their course(s). Getting to visit Fermilab and further their knowledge in the study of physics and engineering was an incredibly useful trip for students to take.